or if a community or work day is scheduled! 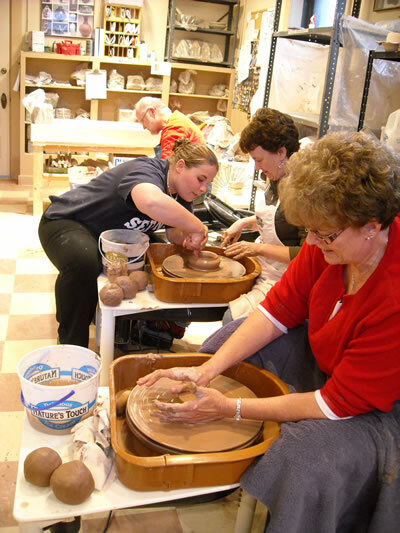 Crossings' clay studio was created to allow clay artists and potters of all levels to explore their creativity and work in a supportive environment. The advantages of becoming a clay studio member are more than just access to equipment and workspace - you get to join a clay community where ideas, inspiration and laughter are generously shared. In the Clay Studio you'll find great natural light, and space for working in clay, whether you're working on the wheel or handbuilding. 24 hours, 7 days a week access to a bright studio space equipped with 12 electric pottery wheels; wedging table slab roller and extruder; on-site kiln firing and access to studio glazes and studio tools; personal shelf space. Our kiln is electric and we fire to cone 6. 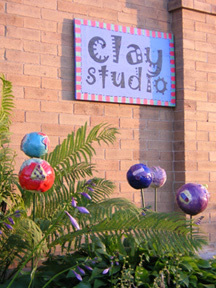 Clay for members costs $12 + tax for 25 pounds. A variety of underglazes and cone 6 glazes are available. Special requests accommodated when possible! Recently added, 11 Coyote Clay Glazes. A full one year studio membership is $55 per month (students $45/month) plus a one-time refundable security deposit of $100. If you sign up for a ONE YEAR Clay Studio membership while taking a wheel class, you will receive $30 off your first two months of membership. Save $60! Dual adult membership (must be one household) $75 per month. Family membership (must be one household and children under 18 must always be accompanied by an adult member) $55 per month + $20/extra family member. 3 months: $75 per month plus a one-time refundable security deposit of $100. $.12 per square inch for daily users.